Fish aboard a NEW Lund 208GL tournament rigged and ready for action! BIG boat comfort with enclosed cabin (heat/air) Bathroom aboard stay safe,dry, and warm! Reel Action Charters Inc. is quickly approaching its 16th season guiding fisherman for Walleye, Smallmouth Bass, and Musky in the Green Bay, Sturgeon Bay areas of Door County Wisconsin. Founded in 1995, the Reel Action Fishing Guides have worked hard to re-invest in the company to provide the best experience possible. The Reel Action Fishing Guides are Pro-Staff for some of the finest companies in the fishing industry including Lund Boats, Mercury Outboards, Lowrance Electronics, Berkly, Fenwick, ABU Garcia and more. Our first-rate gear helps us provide a once-in-a-lifetime experience fishing Green Bay and Sturgeon Bay in Door County Wisconsin which is truly a world-class fishing destination for Walleye, Smallmouth Bass, and Musky. There’s no better insurance policy than investing your fishing entertainment dollars in Reel Action Fishing Guide Service. From the gear, to the boats, to the people, to big fish in the cooler and lifelong memories, we trust that you’ll find we represent the best that Green Bay and Sturgeon Bay Wisconsin has to offer. Green Bay Wisconsin is know for fishing diversity and the potential for a trophy. Where else in the world can you realistically catch a double-ditgit walleye and a smallmouth bass well over 4 pounds in the same trip? Come back in late fall and see some of the biggest muskies to roam the water of North America! Door County Wisconsin offers some of the largest walleyes to be found anywhere in North America. Don't believe it? Well, in spring a 10-pound fish is common. Many have topped the 12-pound mark with some going close to 15 in the past few years! Walleye fishing is good all year long including our ice fishing opportunities in the winter (http://www.icefishdoorcounty.com/). Spring is big fish time, with good odds of catching a trophy. Last ice (Feb/March) offer incredible ice fishing opportunities, while the open water in April and May provide us access to some pristine spawning grounds where we target double digit fish. If you don’t like fishing spring then wait for our warm water fishing opportunities. June thru September is nothing short of outstanding on Green Bay and Sturgeon Bay. Walleye stack up on structure like Voekes Reef, Vincent Point, Monument Shoal, and the Strawberrry Islands. These fish love to bite slow trolled crawler harness and crankbaits all-day long!!! That right! No- need to go out early or fish at night, we can catch these fish thought the day and these fish undoubtedly provide us with some of the most consistent action to be found anywhere. We will catch you walleye we guarantee it! Green Bay and Sturgeon Bay in Door County Wisconsin can stifle some of the best fisherman! It is a huge body of water that possesses some incredible challenges. It is the challenges that keep our team on its toes and challenged to stay on the top of our game. Our network of fishing guides is on the water almost every day all year long. We stay on top of the bite and ensure that you get the best experience possible. One thing we learned with Green Bay and Sturgeon Bay Wisconsin when it comes to walleye is that you cannot fish memories! You need to focus on the cards the mother-nature has dealt you. 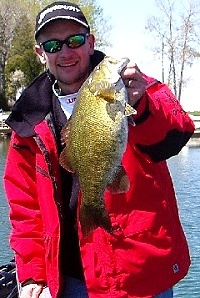 If there's one fish Door County anglers have come to rely on over the years it's the smallie. These bass might be the toughest freshwater fish pound-for-pound and they're extremely plentiful in Green Bay and Sturgeon Bay Wisconsin. Action starts in May when the bronzebacks move shallow to spawn, and the fishing doesn't slow down until ice-up. You'll run into some 6 or 7 pounders here, and you will find hoards of 2s and 3s, along with an occassional 4. This is non-stop fun! We target these fish with a hands-on approach casting artificial plactic bait like tube and grubs, crankbaits like rapalas or smithwicks, and spinnerbaits or swimbaits in the inner bays of Green Bay (Little Sturgeon Bay to Sister Bay). Finding smallmouth bass fishing in Green Bay Wisconsin is made easy when you fish with us. Many can be find right out my parent back door, I grew up with these fish and have spend most of my life targeting them every chance I got. Over the past 15 years I’ve guide 100’s of fishermen every year to some of these backyard honey holes and many most left with life-long memories and next-years fishing trip already planned to return to this magical place which I am lucky enough to call home! The Musky secrets that have been held by Green Bay locals are out! The Fox River and Lower Green Bay produce some of the largest musky found anywhere in Wisconsin and Door County is becoming legendary with many gigantic muskie being caught every year. The fish will tear up even the stoutest tackle and will stretch more than 4 feet long with a menacing mouth of teeth. It's no secret why Green Bay's northern pike and musky get so large. They have a smorgasbord of forage species from perch to alewife and smelt. This results in a fair number of 30+pound fish being caught each year. Casting big baits in the shallow bays during spring can be excellent. Otherwise, late summer and fall brings another northern pike/musky feeding frenzy.